“More hikes might be history,” Eisenberg writes, adding this proclamation is troubling because the “Fed is calling timeout with the Fed’s funds a half point above the rate of inflation as compared to two points historically.” This is the result, he adds, of a weak, but growing global economy. And for that reason, no new monetary stimulus should be planned. Shifting gears and using data with no “intellectual validity and that has been wrong for three years running,” Eisenberg notes the Super Bowl Predictor has a 77 percent success rate and is not to be ignored. If the winning Super Bowl team traces its roots to the old American Football League, the stock market will fall, the Predictor goes. The Patriots’ win against the Rams on Sunday, therefore, means there will be a downturn. But since the New Orleans Saints should have been in the Super Bowl and would have won had they had the opportunity, I feel it is the same as an NFC win and consequently the market will rocket into the 27,000 range. Unless of course, it fails to follow the aforestated logic. Although there has been some upward movement over time, the interest rates have remained low for years, even without government intervention. Perhaps it is time to refer to the old days of 7 and 8 percent rates to return. Following the Great Recession, the Nashville market rebounded more quickly than most markets of similar size across the country. Coupled with the fact that the city began to feel the pain of the Great Recession several years later than markets such as Nevada, Florida and Michigan, the overall impact of the crisis was more subdued than in the rest of the country. The overall market turned during 2012 and gained considerable traction in 2013 as property values began their rapid climb across the nation. Despite the upward strides made by houses that were priced less than $1 million, it has taken an additional five years for the upper-end to return to normalcy. The house at 834 Lynnbrook Road is a good example. Not to be confused with Belle Meade’s Lynwood or Lynnwood – depending on which section of the street the sign is located – Lynnbrook is between Woodmont and Woodlawn, near the Hampton Avenue intersection. 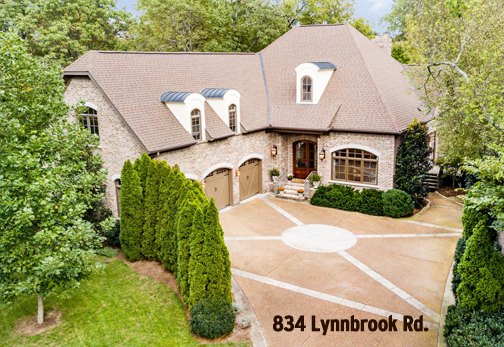 In 2007, as the Great Recession was beginning to sink its teeth into Nashville real estate, the house was purchased for $1.3 million by its first owner-occupant. It served that owner well for three-plus years and, as prices fell, there were other opportunities and plenty of deals available. The owner took a loss on this house, selling for $1,064,000, and moved on to greener pastures. A $236,000 loss was not unusual at that point in the city’s real estate history as prices fell from 25 percent to 35 percent in the upper-end homes. Last week, the house sold for $1,410,000, $346,000 more than was paid in 2010 but only $110,000 more than the 2007 price. This property required the passage of 12 years to regain its value and, even with the recent sale, the $279 per square foot number is not considered outrageous. This property also had to overcome confusing zoning. In layman’s terms, the property owner would own the house and the land beneath and have the rights to improve or destroy anything they wish on that portion of the land. With its townhome zoning, the house has another dwelling attached, and many buyers are not thrilled with the prospect of spending a million dollars and being attached to another, while others prefer the attachment as safety and energy saving measures. This house has 5,062 square feet with four bedrooms, four full bathrooms and a half bathroom, as well as a three-car garage and a climate-controlled wine room. French notes that the ceilings are 20 feet high, and that the “hybrid residential use” has a $10 annual fee attached.